Ever since my grandsons were old enough to talk, we have enjoyed making up "stories". We have fun stories about George the Bear, Monsters, Aliens and of course, Super Josiah and Super Caleb! From time-to-time the boys have illustrated their stories and had me write the words to make our own paper books, but the other day I thought it would be especially fun for the boys to see one of their stories actually "published". 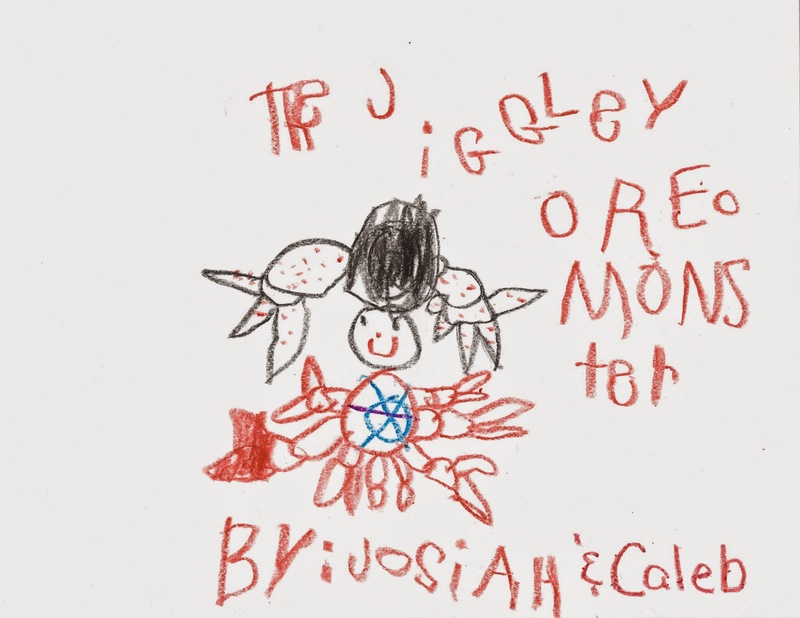 So, we sat down to write a new story - The Jiggly Oreo Monster by Josiah and Caleb. Josiah made up the story and did most of the illustrating; Caleb helped with the illustrating. Josiah dictated the story which I wrote on each page. Then, their poppa scanned each page into the computer making "photos" which I downloaded to Snapfish and made into a book. I had a special offer where I was able to buy one "photo" book and get two for free, so I placed the "photos" in a book, filled in the extra pages with actual photos of the authors/illustrators, wrote "bios" for each of the boys and placed my order. The books arrived Tuesday and I gave them to the boys yesterday . . . Josiah was so happy to see his story actually "published" in an actual book! While this has been fun for me to take the boys' story and make it into an actual book, I love how it encourages them to be creative, to use their imagination and to delight in seeing their story "published"! Who knows! Maybe one day either of them - or both of them - will be actual authors/illustrators and more of their stories will be published!